I had always looked into the windows of the houses around the courtyard. In most windows, I saw people working and children playing. When the soldiers came, people began covering their windows, so I couldn’t see inside anymore. But the tiny attic window of the narrow brick house behind Otto Frank’s business offices had no window shade. For a long time, the rooms were empty. Then one day, Otto’s whole family came to live there. They called their new home the Secret Annex. . . . 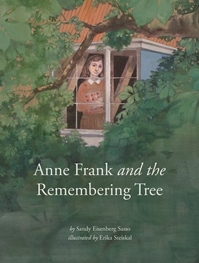 This is a story of Anne Frank and her sister Margot, who loved a tree, and the tree who promised never to forget them.